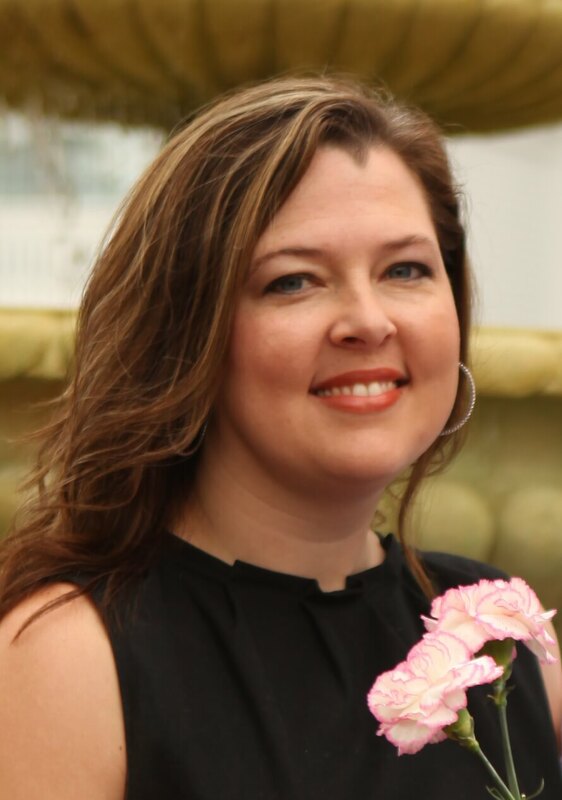 What a week it has been y’all! I’m glad it’s behind me. 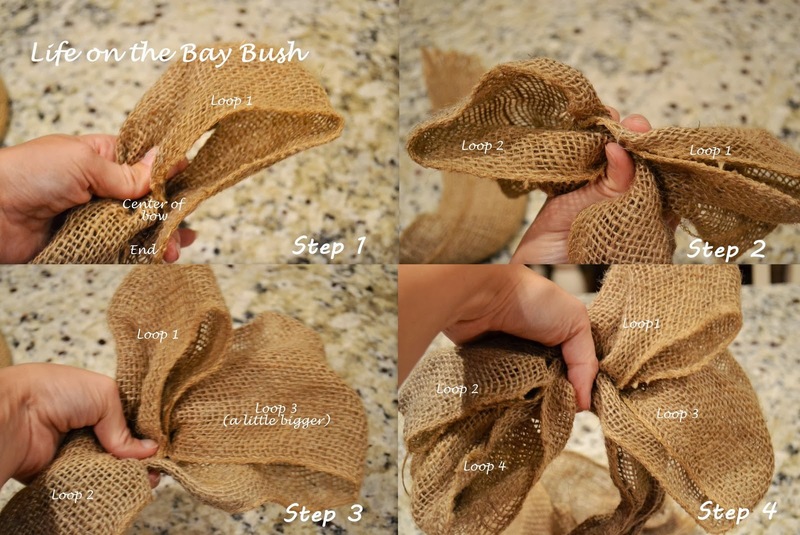 Someone emailed me to ask if I posted a tutorial go to with the Burlap Bows that I made for my front porch at July 4th. I told her I would see what I could whip up this weekend. I didn’t have any more of the burlap ribbon that I bought at Michaels left so I took apart one of the bows from the porch and re-made it, taking a slew of pictures along the way. I used the same method for the bows that I use with wired ribbon. But I think the burlap is easier to work with than ribbon. 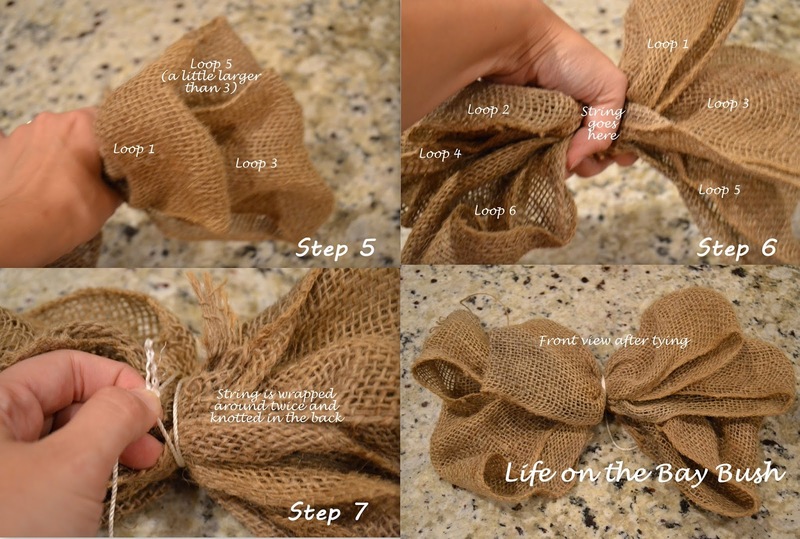 SO if you can make a bow out of wired ribbon…you can easily do one with burlap. I used a 6 inch wide burlap roll from Michaels. Step 1: Start by making a loop with the burlap, keeping the end a little longer than the center of the bow. Step 2: Make a loop on the other side about the same size as Loop 1. Step 3: Make another loop on the same side as Loop 1 but make it a little larger than the first loop. The end of my Loop 3 is about an inch and a half longer than Loop 1. Step 4: Make another loop on the other side about the same size as the one you just made on the opposite side. So now you’ve got 1 small loop and 1 medium loop on each side. Step 5: Make another loop a little larger on the same side as Loops 1 and 3. Step 6: Make Loop 6 on the opposite side sized to match the one you just made on the opposite side. Now you have a small, medium and large loop on both sides. Step 7: Wrap a piece of string or twine all the way around the bow twice and tie in a knot in the back. The fourth shot in the picture shows the front of the bow after it is tied. Step 8: Cut a piece of burlap twice as long as you want the streamers hanging down from the bow. Step 9: Tie the streamer to the bow at the center with another piece of string or twine. And then you’re done! Bow city! The whole thing takes less than 5 minutes!